An image of a heartwarming exchange involving a police officer and a black teenager at a McDonald’s in Texas has gone viral. 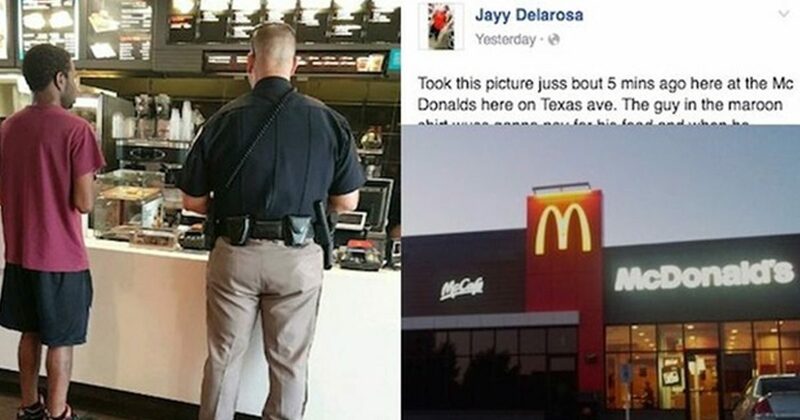 The picture shows the officer buying the teenager’s meal. Although the teenager, who is seen wearing a maroon-coloured shirt, had his wallet out, the officer – identified as Michael Calhoun, a Brazos County Sheriff’s Office deputy – told the kid that he could put his wallet away and get whatever he wanted. Jayy Delarosa, the photographer, wrote under the photo that he just took the picture to show that there are still some very good cops in the world. Delarosa’s picture has been shared more than 2,000 times in the first two days of being posted on the popular social media network.